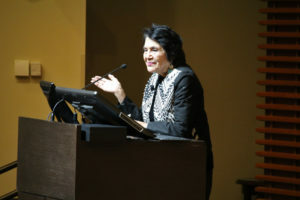 Civil rights activist Dolores Huerta visited Stanford Thursday night to give a speech and take questions from an audience of Stanford students and local community members in CEMEX Auditorium. Dolores Huerta (EDER LOMELI/The Stanford Daily). Huerta, who received the Presidential Medal of Freedom in 2012, co-founded the National Farmworkers Association (which later became the United Farm Workers) in 1962 alongside Cesar Chavez. She currently serves as president of the Dolores Huerta Foundation, “creating networks of healthy organized communities pursuing social justice through systematic and structural transformation.” 2017 also marked the release of a documentary on Huerta’s life, titled “Dolores” and directed by Peter Blatt. During the night’s event, Huerta gave her views on a variety of issues, including income inequality, immigration, workers’ rights, women’s rights, LGBT rights and climate change. However, education took center stage. “If you do not have an educated citizenry, then what you have is mob rule,” Huerta said. Huerta described what she sees as a corrupt school system, especially in California, where people of color are suspended and expelled from schools at a much higher rate than white students in what Huerta referred to as a “school-to-prison pipeline.” Huerta also expressed frustration over not getting to learn about contributions people of color made to the United States. “The African slaves who built the White House, who built the Congress, who built much of the infrastructure of this country, have never been recognized,” Huerta said. To remedy the education system, Huerta called for progressives to run for school board positions in addition to positions in state assemblies and Congress. She expressed concern over gender discrepancies in education in addition to racial ones. “What do we do in terms of our education to say to everyone and to young boys, ‘Women are equal. Women are equal, and you’ve got to treat every woman like she’s your sister or mother?’” Huerta asked. She praised recent women’s marches and the resistance movement, calling for chants of “viva” to honor people such as Martin Luther King Jr. and Cesar Chavez. However, Huerta said protests alone are not enough to create the changes she wants to see. “I don’t think we will have peace in the world until feminists take power,” Huerta said, putting a twist on a quote by civil rights activist Coretta Scott King. Huerta later qualified her statement by claiming that men, too, can be feminists if they fight for the rights of women, workers, immigrants, the LGBT community and the environment. “If we don’t take those marches, if we don’t take those protests down to the ballot box, it doesn’t make any difference because the only way that we’re gonna make those changes is we’re going to have to elect people to office who are going to make those changes,” she said. Huerta, who is also honorary chair for the Democratic Socialists of America, called ignorance the blight of the country and made several references to President Donald Trump during her speech. She said Trump is making matters worse for people who want to immigrate to the United States. “I actually think we need to build our own wall, but our wall needs to be in the U.S. Congress to make sure that whatever comes out of the White House, that if there’s any way we can do to do it, that we need to stop what is coming out of the White House,” Huerta said. She also expressed frustration over the newly passed U.S. tax plan, which she said decreases the corporate tax rate at the expense of social equality. “I think this is total corruption, and we have to find ways to change it,” she added. Huerta pointed out that people of color are the majority in the United States and worldwide. She said that minorities, feminists and what she called “white men of conscience” should be wary of capitalism and technological advancement with regards to workers’ rights. She also expressed concern not only over capitalism, but also the socioeconomic impact of technological advancement. At the conclusion of her speech, Huerta advised the audience to consider her question. She called Stanford “kind of a corporate university” and acknowledged that since so many technological advances occur in Silicon Valley, people in the area should consider the social implications of their work. “In the meantime, while most of you are doing that heavy thinking and that visionary stuff, we will be down at the grassroots level organizing the people at the bottom to make sure that they get the positions that they need,” Huerta said. Following her lecture, Huerta received a plaque from the Center for Comparative Studies in Race and Ethnicity to commemorate the event. Artist and activist Favianna Rodriguez then presented Huerta with a piece of artwork modeled on Huerta’s values. The art depicts “Mother Earth, who’s hugging the world because Dolores fights for the people who are most connected to the land, and we have to understand that our fight for justice is also a fight against climate change,” Rodriguez said.